Join the discussion on our forums! Come discuss Eternal Servitude over in our dedicated Eternal Servitude discussion topic. Found what seems to be a bug, or an unintended result of (scroll up)Eternal Servitude and Priest's Lesser Diamond Spellstone, where even if you summoned 3 of the same dude, the spell stone will only resurrect one of your copies, ever. Make this card cost 6. Gather Your Party can maintain an archetype. Make it on par with Shadow Essence . No more early swings. I hate this card. I just want to thank Blizzard personally for this card. We now have Priests killing their own Prophet Velens in order to safely resurrect them. Thank you so much for that. Thank you for all the "summon a copy" and "resurrect a super random card" you built into Priest. I hate playing against this card and I'm sure non-aggro decks would also find it frustrating to deal with. I find it incredibly irritating that a priest can summon a 4 mana 3/4 body with a 1/1 Velen/Malygos/Lich King on turn 4, then resummon a full health Velen/Malygos/Lich King on turn 5 more than half the time. I've played more than a dozen priests over the last two days and this has happened to me over 80% of the games. It doesn't seem overly complicated to pull off. You just need 2 specific cards by turn 4 to do it. By turn 4, you will have drawn 7 of your 30 cards in your deck. Assuming you have 2 copies of this card, you'll have about a 50% chance to have at least 1 copy of it in your hand. Having Barnes by turn 4 is about half that chance, but then you have to remember you can mulligan for these cards, which actually makes the chances of having both quite a lot higher. It feels dirty. It's almost as unfun to lose against this combo as it is to lose against pirate warrior imo, because the value of the cards being used do not match their mana cost in the slightest. Pirate warrior still feels more dirty because it takes no skill: Just play cards as you draw them in a relatively non-difficult-to-figure-out order and you'll win most of your games. But with this combo, if the priest gets it off, you stand almost a 0% chance of coming back. I literally had a priest draw 5 DK cards by the end of his 7th turn because he summoned the Lich King three times with barnes + serv + serv. I even KILLED it all three times it was summoned but the sheer amount of value he got out of those cards at such an early point in the game was insane, also requiring me to use my removal on it (when he had other cards such as Velen and Malygos in his deck). How are you supposed to win against that? Then, to put the icing on the cake, if all else fails he just ends up spamming small cost spells due to lyra later on and burning you down with his zero cost hero power that does 2 damage and refreshes when a card is played. Like, yeah...I'm salty. But the power level of some of these cards in this set make me wonder if Blizzard even REALLY play tested this stuff before making it. This and the 10 mana druid spell are so out of line for their mana cost and you could see it from miles away. Overvalue, depending on a deck of course. The big question is this; As a discover mechanic, is this effect heavily weighted towards class cards and legendaries? In other words can I get Velen back almost guaranteed if I play cleric and acolyte of pain? Because, if the answer is yes, I think a Velen combo deck could actually work in a meta just a little slower than ungoro. The problem is that, in Priest, you rely on minions to cycle through your deck. So any combo priest that wants to run only a few minions is going to run into trouble. 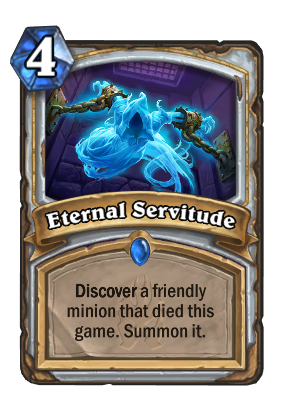 This with Obsidian Statue is gonna be so annoying..
A really powerful card in priest's hands!This package of priest cards is really amazing..Can't wait to try priest new things in new expansion! Disguised Toast's next deck: Wild Meme Priest featuring all resurrect style spells, Barnes, Malygos, Prophet Velen, Y'shaarj, board clear spells, and burn spells, for the laughs! Nothing I can say that hasn't been said. Powerful effect. Better than Resurrect. No more getting back Doomsayer when you don't want it. Scary good if Quest Priest makes it into the meta. Very powerful card. The flavor of this card is a little depressing. My minion was destroyed, and its spirit now just wants to rest in peace. Instead, I've shackled its spirit, thrusting it back under my eternal servitude.